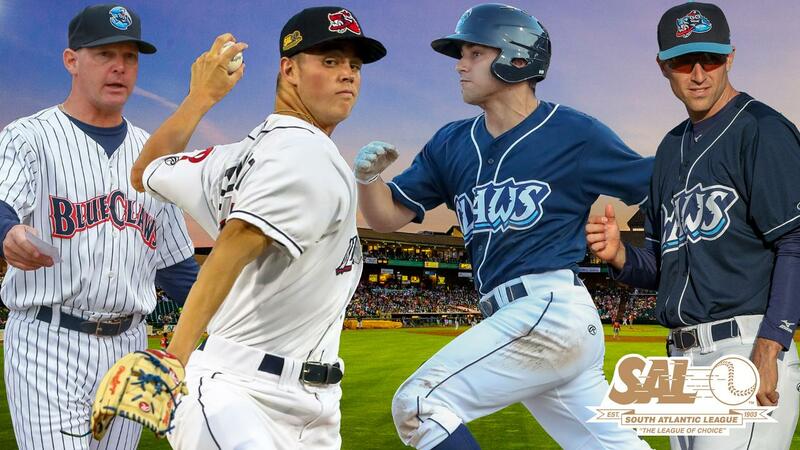 The BlueClaws placed four on the South Atlantic League Post-Season All-Star Team, including infielder Jake Scheiner and pitcher Will Stewart as well as manager Marty Malloy and pitching coach Brad Bergesen. LAKEWOOD, NJ - Four BlueClaws have been named to the 2018 South Atlantic League Post-Season All-Star Team. Manager Marty Malloy, pitching coach Brad Bergesen, infielder Jake Scheiner, and left-handed pitcher Will Stewart were named South Atlantic League Post-Season All-Stars, it was announced Tuesday by league president Eric Krupa. Malloy is in his second season with the BlueClaws and led the team to the Post-Season this year. Entering Tuesday night, the BlueClaws have won 82 games and could become just the sixth team since 2000 to win both halves of a South Atlantic League season. Lakewood is two wins shy of tying the franchise record for wins in a season with 84. Malloy joined the Phillies organization last year as the manager of the BlueClaws after spending the previous three years managing the Gulf Coast League Astros. Scheiner was named as the team's Utility Infielder. He was a 4th round pick in the 2017 draft from the University of Houston. This year, he has started more than 20 games at third base, first base, and left field. He enters Tuesday hitting .299, third-best in the league and including .341 in the second half. Since the All-Star break, he leads the league in both batting average (.341) and on-base percentage (.431). Stewart, a 20th round pick in 2015 from Hazel Green (Alabama) High School, is the fifth BlueClaws pitcher to be named to the league's Post-Season All-Star Team, following: Carlos Carrasco (2006, Right-Handed Pitcher), Matt Maloney (2006, Left-Handed Pitcher), Jesse Biddle (2011, Left-Handed Pitcher), and Will Hibbs (2017, Relief Pitcher). Lakewood will enter the South Atlantic League Post-Season for the fifth time in team history beginning Wednesday, September 5th. The BlueClaws will host Games Two and Three of the SAL Northern Division Championship Series on Friday, September 7th and if necessary, Saturday, September 8th. 2018 BlueClaws Playoff Five Packs are currently on sale by calling 732-901-7000 option 3 or online by clicking here. Playoff tickets are complimentary with a 2019 BlueClaws Five or 10-Game Membership Plan. For additional information, click here.